Locality: United States, Colorado, Chaffee, Central Colorado: Sawatch Range, East Slope Continental Divide: Chalk Bluffs area below Mount Princeton, at the Colorado Trailhead, ca 7 road mi on County Road 162 from U.S. Hwy 285, ca 8 air mi WSW of Nathrop, ca 10 air mi SW of Buena Vista. Habitat: Pinus ponderosa and P. edulis forest to mixed forest on talus slope. 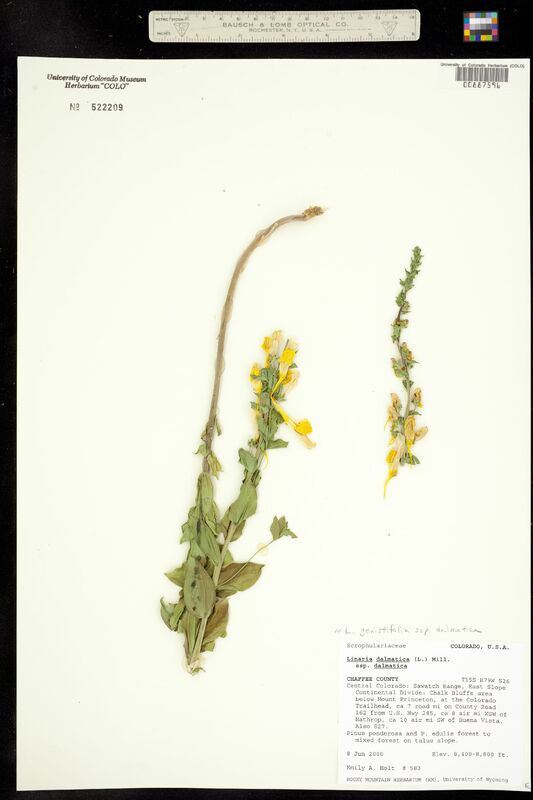 Elevational range: 8400 - 8800 ft.
Notes: Originally ID'd as Linaria dalmatica (L.) Mill. subsp. dalmatica.